Last night, in a twitter party hosted by Jill - author of BabyRabies.com, FuzziBunz announced details of the three new lines they're launching. The main difference is that they've tweaked the adjustable elastic so that the adjustment buttons no longer touch the baby's skin, and they've switched the microfiber insert for a milky insert which will be able to absorb the same amount with fewer layers. Meet the Elite: One Diaper—Birth to Potty Training! The second line released last night is the limited series Elite Diaper Talk. This diaper is the new elite diaper with 4 digitally printed (not screen printed that can flake off) design options on the booty. Cute diaper colors with contrasting colored snaps. 5% of the proceeds will go towards charity. For a limited time only, FuzziBunz® is bringing you a cloth diaper line that is fun, functional and oh-so-funky and fashionable too. 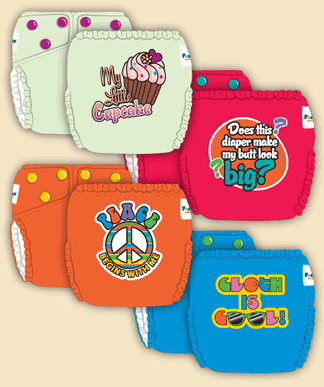 The FuzziBunz® Diaper Talk™ line is digitally printed (not screen printed) on our One Size Elite cloth diapers. These fun designs can be seen printed on cool background colors with contrasting colored snaps to boot! These designs will not peel or fade and will bring a splash of color and interest to the rest of the well loved FuzziBunz® color collection. To kick off this limited edition line, FuzziBunz® has committed to donating 5% of its Diaper Talk line's net sales to Wounded Warrior www.woundedwarriorproject.org. A training pant with the digitally printed designs (similar to the Diaper Talk series) that look like big kid underwear but are lined with minky so the child can feel the wetness. What do you think about the new designs & graphics? I don't like the graphics. I do like the fact that the button is on the inside now, though. A few times my little guy has developed a rash where the button and elastic touch his leg. The new designs are ok.. I think they could have done better.